PRINCETON, N.J. -- U.S. consumers' self-reported daily spending over Black Friday weekend was statistically similar to the average for each of the past two Black Friday weekends but remains well above the levels recorded in the immediate post-recession period. 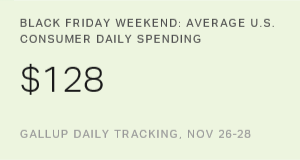 Consumers' self-reported $128 in average daily spending from Friday, Nov. 25, through Sunday, Nov. 27, is within the margin of error of the $115 and $116 averages over the same three days in 2014 and 2015. However, it is higher than the $102 recorded in 2013 and several sub-$100 readings in earlier years. These averages do not include spending on Cyber Monday -- the Monday following Thanksgiving, which, because of deep online discounts that day, has become the biggest digital shopping day of the year. 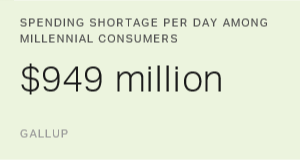 Gallup's spending measure asks consumers to estimate how much they spent on retail goods or services "yesterday," either in person or online, not counting home or vehicle purchases. While this kind of spending would include gift purchases, it also covers money spent at restaurants, grocery stores, gas stations, hair salons and other places not associated with gift-buying, but easily influenced by consumers' holiday activities. The seven-day average of consumers' daily spending over the entire Thanksgiving week -- from Sunday, Nov. 20, through Saturday, Nov. 26 -- averaged $106. 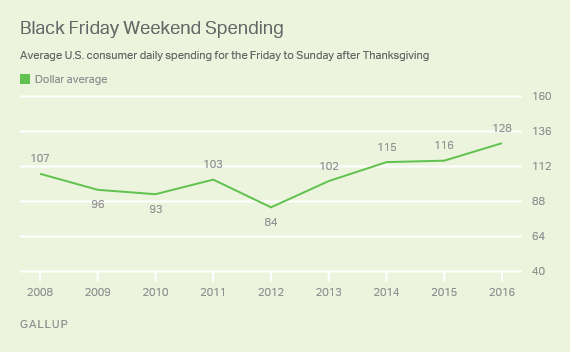 That falls within the $100 to $110 range for Thanksgiving week reached from 2013 to 2015, supporting Gallup's finding that holiday retail sales appear on track to be about average. But Will Spending Stay Higher Longer? Although Gallup's late November consumer spending figures are on par with recent years, week-by-week spending in November shows that spending kicked up a bit earlier than usual. Average daily spending jumped to $103 in the third week of the month from an average of $87 in the second week. That $16 increase contrasts with an average $1 increase between the second and third weeks of November over the eight years from 2008 through 2015. 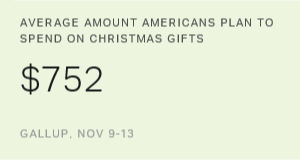 Thus, it appears that holiday spending may have gotten off to an early start, perhaps aided by the recent boost in Americans' outlook on the economy. The key question for retailers is whether this momentum will continue in December. Last year, consumers' self-reported spending dipped to about $90 in the first half of December after reaching an average $101 in late November, but then surged in the third and fourth weeks of December. These 2015 shifts -- which were statistically significant, given the weekly sample sizes -- conform with analysis by the National Retail Federation that warm December weather, combined with consumers' increasing reliance on online shopping and determination to wait for pre-Christmas sales, may have pushed the 2015 holiday shopping peak to later in the season. Gallup's weekly spending estimates this December will help clarify whether the 2015 pattern was the start of a new model of consumer behavior driven by internet shopping or if it was unique to that year -- perhaps more weather-driven. Consumers' holiday shopping spree started a bit early this year and, even without factoring in Cyber Monday sales, spending over Black Friday weekend was brisk. More broadly, the extent to which consumer spending results in average or above-average holiday sales for retailers is still largely dependent on what happens next month, and that is far from predictable. Although factors such as the weather are beyond retailers' control, reaching consumers online, connecting with their attachment to Christmas (around nine in 10 Americans indicate they celebrate the holiday) and offering them value in a highly competitive marketplace are not. While much of this spending may occur online in the final week before Christmas, the fact that the holiday falls on a Sunday this year means many procrastinators may take advantage of Christmas Eve being a Saturday to finish their holiday shopping the old-fashioned way -- pounding the pavement at malls. Results for 2016 Black Friday weekend spending are based on telephone interviews conducted Nov. 26-28, 2016, on the Gallup U.S. Daily survey, with a random sample of 1,512 adults, aged 18 and older, living in all 50 U.S. states and the District of Columbia. For results based on the total sample of national adults, the margin of sampling error is ±$22 at the 95% confidence level. 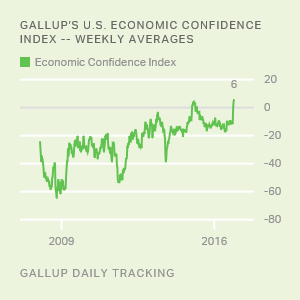 Gallup's weekly spending estimates are generally based on 3,500 interviews with a nationwide sample of U.S. adults on the Gallup U.S. Daily survey, and have a margin of sampling error of approximately ±$12 at the 95% confidence level. All reported margins of sampling error include computed design effects for weighting. The 43% of Americans who say it is a good time to find a quality job is generally in sync with what would be expected, based on current U.S. unemployment rates hovering near 5%.